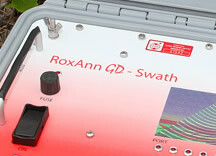 The RoxAnn GD-S is a multibeam version of the standard single beam RoxAnn. It is built into a portable transit case and includes a transducer which can be through hull mounted or over-side mounted. This unit uses a special version of the RoxMap plotter program to allow data from the multiple beams to be logged and exported to GIS. Describes how to operate the basic components of the RoxMap plotter application. A downloadable demonstration of the Swath application of the RoxMap plotter. What is the RoxAnn GD? The RoxAnn GD range of products are electronic units which digitally process the echoes from third party echo-sounders and provide measured indices which allow seabed material types to be detected and classified. The RoxAnn GD is based upon methods which were developed originally in the 1980's to analyse seabed echo data. The GD is the latest state-of-the-art implimentation of these methods in a range of seabed classification prodicts. What do you need to make a RoxAnn seabed classification system? The RoxAnn GD consists of a single printed circuit board (PCB). This is built into a variety of housings and assemblies. The most common are the RoxAnn GD and RoxAnn GD-A, these are stand-alone processors intended to be interfaced to other third party equipment. An echo-sounder (frequency range 24kHz to 210kHz). A PC or laptop running or other compatible plotter package. A GPS unit with NMEA output. The GD-X range includes a built-in echo-sounder and a dual frequency transducer which is suitable for over-side or hull mounting. It is supplied in a weatherproof carrying case for portability. Click here to go to the products page for further details. The GD-Z is a dual channel (Stereo) version which concurrently processes data from two sounders - normally an HF and and LF unit. This provides the ability to determine sediment depths. Click here to go to the products page for further details. The GD-S is a multibeam version of the single beam RoxAnn. It provides seven individual beams covering a 60 degree included angle swath. Each beam provides seabed classification data and a special version of RoxMap plots the output from each beam. Click here to go to the products page for further details. Does connection and use of RoxAnn affect the echosounder? The high impedance of the RoxAnn receiver imposes virtually no load on the received signal from the transducer and therefore has no visible effect on the echo-sounder display. The user can change most echo-sounder settings (gain etc.) to suit his wishes on how the display looks. This will not affect the RoxAnn performance because RoxAnn measures signals directly at the transducer. The only change which affects RoxAnn is a change in the output power of the echo-sounder (this changes the "strength" of the echoes). This will occur when the range is changed or the power output level is changed. However, RoxAnn GD has a built-in compensation for power changes. The echo-sounder output power is calibrated during the RoxAnn calibration process and will compensate for changes in power level automatically. However, we have no control over the quality of the echo-sounder installation or signals, so accurate compensation cannot always be guaranteed. Look for a separate FAQ about this subject, it's very complicated! What echo-sounders will RoxAnn GD work with? Virtually all of them. We have not failed with any sounder so far! However, it is essential that the echo-sounder installation is good. Any noise in the system is a problem since RoxAnn is far more sensitive to noise then the average echo-sounder operator. Some new echo-sounders are also too clever! They operate in an automatic mode where power output settings and range are automatically adjusted. This is not good for RoxAnn! However, we've always been able to set this type of sounder to a manual mode where changes are instigated by the user. The RoxAnn GD uses two way communications with the PC to allow the user to set up their echo-sounder type and operating conditions. Fundamental to this process is the ability for the PC installation software to recognise the serial number of the GD unit. Occasionally, the unit serial number can be corrupted if the PC outputs garbage at any time or (more likely, from our experience) someone connects a GPS unit to the RoxAnn GD RS232 (D-type) connector. NOTE: This problem only applies to GD models with serial numbers which start with the characters "GD". Make sure that the GD is connected to the PC using RS232 or USB. Make sure you know the correct serial number of your product, this will be under the flaps of the GD and GD-A box or prominently displayed on other verisons of the GD. Open hyperterminal and select the COM port to which RoxAnn is connected. Connect to the COM port and send the "*" (star) character. A reply message should state the version number of the firmware. Send the "+" (plus) character to view the serial number. If the number is not in the form "GD0xNxxx" then it will need to be reset. Send a "," (comma) and follow this with the serial number of the unit (8 characters in the form as above). Send 2 "space" characters and follow this with a "p". Reset the RoxAnn by removing and then re-applying power. Send the "+" character to check that the serial number is correct. if not, repeat the process. How is the RoxAnn GD connected to the transducer? The transducer cable supplied with the RoxAnn is a twin coaxial construction. The cores of these coaxials (red and yellow) connect to the signal cores of the screened twisted pair connecting to the transducer. This connection can be at the transducer location in the bilges or at the echo-sounder transducer terminals. The connection to the RoxAnn is to the X connector pins 1 and 2. Polarity is not important. The coaxial screens are connected to the screen of the twisted pair to the transducer. This is pin 3 of the X connector. The cable supplied with the RoxAnn is approximately 1.5m long. This can actually be extended well beyond this length. However, RoxAnn relies on a high signal / noise ratio and acceptable cable lengtrhs are only determined by this. In practical terms, several tens of metres should be acceptable in a good installation. What do the LED's at the left side of the GD board signify? In very shallow water the sounder transmit pulse width can be a significant percentage of the travel time of the echo through the water. In extreme cases, the transmitter could still be transmitting when the first part of the first echo arrives. Before that happens, the trailing edge of the transmit pulse starts to affect the measurement of E1 and introduces large errors. The solution for shallow water operation is to reduce the echo range as much as possible thereby reducing the pulse width or, for higher quality sounders, reduce the pulse width through the sounder menu settings. 1. If the water depth is significantly less than that chosen during calibration then the first echo may arrive before the blanking pulse has completed. This prevents RoxAnn recognising the echo and stops the RoxAnn process for that ping. To overcome tis problem, retune the RoxAnn with a lower minimum depth and then recalibrate at sea. 2. In shallow water the echo signals are very large and can oveload the RoxAnn receiver. When this occurs, the signal is clamped at a value too small to register as an echo. This problem usually happens if the initial configuration was incorrect and can be corrected by retuning and recalibrating as above. The ship position is shown on the "position" menu bar at the top of the screen along with the mouse position and some other data. If the ship position is blank, the data from trhe GPS is not being recognised. First of all, be sure that the GPS unit is sending the correct data to the PC. This should be an NMEA 0183 data string with an update rate of once per second and a baud rate of 4800. The type of string should be either GGA or GLL position data ( choose one that has at least 3 decimal positions of lat / lon data). A VGA string giving ship bearing should also be provided if available. Check that the GPS is outputting this data using hyperterminal. This should be set to receive data on the COM port to which the GPS is connected at 4800 baud, 8 data bits, no parity, 1 stop bit and no flow control. If strings are displayed in hyperterminal with these settings then the GPS setup is OK. Remember to close hyperterminal! If the position still does not appear in RoxMap, then it is likely that the GPS (or an opto-isolator unit in the GPS data cable) needs to have handshake signals. This can be solved by modifying the "roxmap.ini" file in the "windows" directory. Set AssertHandshake to 1. This will enable the RTS and CTS lines which the GPS unit or an opro-isolator may need to see. Save the "roxmap.ini" file and restart RoxMap. The GPS position should now appear in RoxMap. The RoxAnn data appears to be always towards the lower left section of the RoxAnn square. The first thing to consider is that all echo-sounders and transducers are different. Even the same sounder / transducer combination on different ships can different results. This is why the RoxAnn square can be calibrated to suit the individula installation and the users priorities. If you're using a version of RoxMap, the scales of the RoxAnn square can easily be changed. If you find that rough, hard rock gives you E1 and E2 values of only around 1 volt, then the scales can be adjusted to make that range of values fill the whole box. The RoxMap manual explains how to change the characteristics of the RoxAnn box. If you're using a third party plotter, these usually have the same scaling features as RoxMap. Check with the plotter manual or manufacturer in this case. Note that high frequency systems often give lower E1 and E2 values than low frequency systems. This is all dependent upon output power, transducer beamwidth and many other factors which are outside the control of Sonavision! I get an error message telling me that the charts.ini file is invalid. Pressing OK clears the message and everything appears to work from then on! This is just an advisory message, it doesn't appear affect RoxMap operation. It is generated by the Euronav part of the RoxMap application. if you wish, the problem can be solved by replacing the corrept "chart.ini" file in the RoxMap folder with a valid version. Click here to download the file. Unzip and put in the Roxmap folder. Note that there is a file called "charts.ini" in this same folder - please note the difference and don't change this file by accident! How can I copy (or backup) my RoxMap data and tracks to another computer? RoxMap data is stored in a database in the RoxMap folder. The folder named "database" contains the stored data and other files used to manage the database. The complete structure can be moved to another location using windows explorer. Simply copy and then paste the complete database folder to another location such as a USB stick, CD or a location on your hard drive. If you need to restore that data into RoxMap then use the same copy / paste procedure. The "MultiDB" application complicates this procedure. MultiDB allows the user to set up several diffterent databases which can be selected one by one. If you want to back up all your data, you need to also copy / paste any other database you have created using MultiDB. These will be in folders, the names of which you will have chosen. Remember to copy these also. You may have saved the configuration of your RoxAnn squares also. These should also be backed-up or copied along with the database. These are stored in the "Boxfiles" folder as "*.box" files within the RoxMap folder. Use the same copy / paste routine for these files also. Finally, never, ever try to copy individual tracks from the database!! The ship postion in RoxMap jumps around in large steps rather than smoothly. RoxMap accepts GLL or GGA strings from the GPS system. Sometimes, the data is sent with a resolution of two decimal places instead of three or more. If the data is only sentr with two decimal place resolution, the ships track on the Roxmap display will appear to be made up of steps instead of showing as a smooth line. To solve the problem, set up the GPS unit to only output GLL or GGA strings with three decimal place resolution. You can also force RoxMap to listen to only one string type from the GPS by editing the "roxmap.ini" file in the windows folder. Look for the NMEA0183 section and set the string you don't want to listen to, to zero. Do not turn off the VTG string as this provides bearing and not position data. In some insatallations of Windows XP, the drivers for the dongle do not load correctly. Navigate to the SECURITY folder on the RoxMap installation CD and run "HaspUserSetup.exe"
This will load the correct dongle drivers. When correctly installed, there is a red LED on the end of the dongle and this should illuminate. The depth display is an extremely good quality assurance mechanism for RoxAnn and echosounder system. Depth spikes up to the surface indicate that something in the water column is producing echoes. This may be, amongst other things, fish, plankton or cavitation under the hull. Fish and plankton are factors over which we have no control but cavitation is a boat / weather induced phenomenon which usually reduces noticeably with the boat stationary. The effects of these are made worse if the gain of the RoxAnn is too high and it is often possible to minmise by reducing the manual gain. If the gain is reduced too far then the first seabed echo may also be lost in soft bottom areas. There is usually a compromise to be found. There are lots of depth spikes on the depth dispaly pointing towards the seabed. This problem indicates loss of seabed echo and will be most prominent in soft bottom conditions. This can often be corrected by increasing the manual gain although this can introduce problems highlighted elswhere with cavitation, fish and plankton. The problem may also be caused by cavitation, fish and plankton because these attenuate the acoustic signal and produce false echoes. Sometimes these give false returns but otherwise the attenuation reduces the first echo signal to less than the detection threshold in RoxAnn. I get sudden depth changes which are not explained by changes in water depth. Sometimes it is possible to fine tune the gain of the RoxAnn to differentiate more accurately between the false echoes and the true seabed echo. Later versions of the RoxAnn incorporate a depth tracking feature which reduces the susceptibility of RoxAnn to the false echoes, particularly those associated with sidelobe effects.